From Abergavenny on the B4269 or from Llanfoist or Blaenavon on the B4246. Park only in the car parks, do not park on the roads, verges or passing places. Parking on top of the mountain for key holders should be as far back from T/O as possible in lumpy ground behind hut. Vehicular access to take-off is restricted to approved permit holders only. Access for all other pilots is by foot only (a long carry up). The SE take-off is shallow. There is a risk of not clearing the ledge. The NE Bowl is a committed take-off, for paragliders there is a significant risk of not clearing the ledge below and so the flat take off area should be avoided. When windy it is often turbulent behind take off. Beware of being dragged into the Hut, or parked cars! Hang gliders should use a nose man whenever possible. Hang gliders should always take-off from the very edge of the bowl, even in nil wind. The Northwest take-off is quite friendly. A view of the top of the Blorenge. 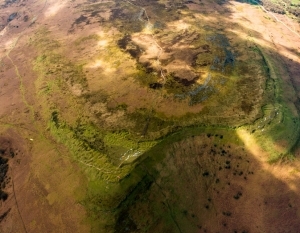 The NE facing bowl is in the middle of the image, while the NW side of the Blorenge is on the right of the image. Photo courtesy of Harry Bloxham. All top landings can be turbulent, land well back to avoid rotor. The SE top landing area (A) is difficult for hang gliders due to the angle of the slope. 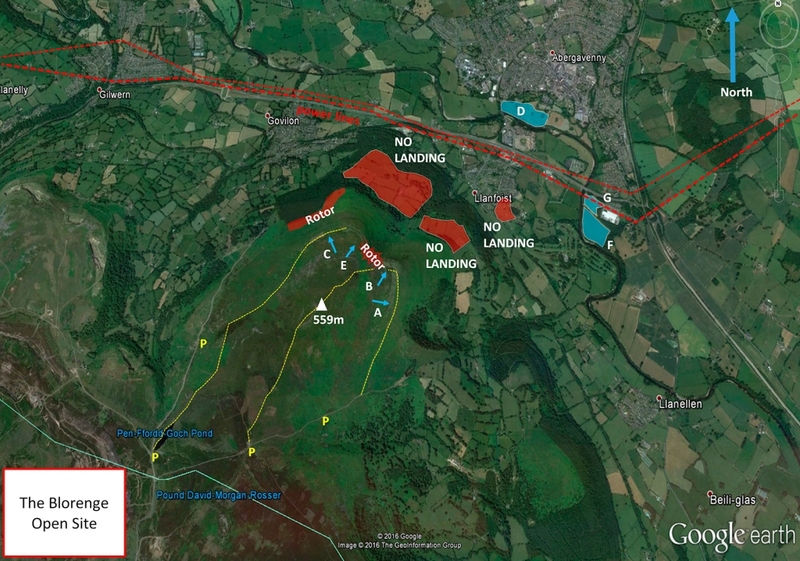 The NE top landing area (B) is rough ground, watch out for the craters towards the front. Paragliders slope landing in the NE Bowl should watch out for the trees. The NW top landing (C) is fairly smooth, but slopes gently towards take-off. Paragliders slope landing below the NW face should watch out for rocks hidden in the bracken. Paragliders can sometimes find the bottom landing field at Castle Meadows (D) difficult to reach. Once over the power lines there is no turning back if met by heavy sink. Paragliders in any doubt about making it safely to Castle Meadows should make an early decision to slope land on the side of the Blorenge. Landing fields F and G are only to be used in an emergency; for example when crossing the powerlines to Castle Meadows (D) is impossible due to an unfortunate encounter with sinking air. Access to these fields is via Faccenda, a Turkey processing plant accessible from the A465 westbound, approx 200m from the Hardwick Roundabout. There is plenty of parking available and drivers should explain to the security guards in the hut that they are accessing the property to recover paraglider pilots. Egress is onto the A4042 northbound which is shortly before the aforementioned roundabout. A committed site which can accommodate 30 plus gliders when conditions are good, but less than 5 gliders if conditions deteriorate. The site to go to in light winds. It also has tremendous potential for triangle and out and return flights. A view of the top of Blorenge, looking east – the Blorenge is just to the right of the red paraglider in the foreground. The Skirrid is visible to the east. Beware of high voltage power lines in the valley and rotor behind take-off. All enclosed fields on the mountain are strictly out of bounds. This is a site of Special Scientific Interest – please treat it with respect it deserves. Dogs are not permitted on the hill. Open site – This site may be flown by all suitably insured hang glider & paraglider pilots. The Blorenge is owned by the SE Wales Hang Gliding & Paragliding Club Ltd. The Blorenge has some amazing XC potential for those light wind thermic days. PG – Harry Bloxham, Luke Nichol, Mark Watts and Lawrie Noctor flew their Ozone Enzo 3s and Zeno 100.5 km (declared triangle earing 271.3 km in XCL points) on 07 July 2018. The Blorenge Mountain 3.4km SW of Abergavenny Town. Near A40/A465 interchange.